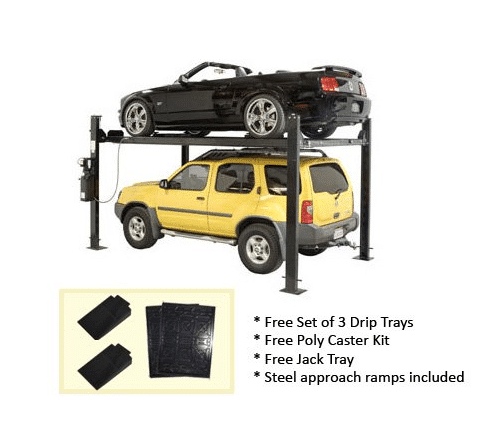 Car lifts, or auto lifts, offer a safer environment to work under a car, as compared to jacks. They also make it easier to perform work because of increased space. 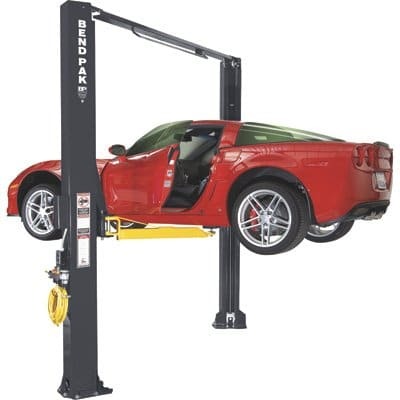 The car lifts reviewed here make for great tools in a home garage for several reasons, including affordability and ease of use. Many mechanics that have used these lifts say they wish they had bought them years ago – as it would have made it easier to get the job done. 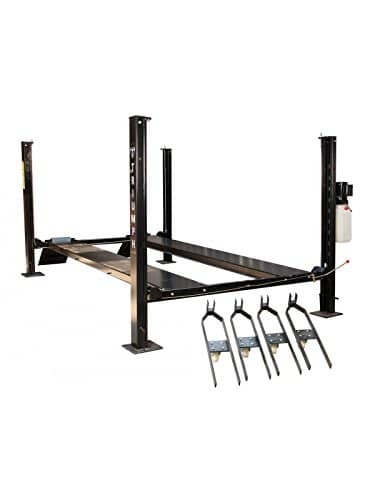 The top choice for a home garage auto lift is the BendPak Portable Mid-Rise Scissor Lift – 6,000lb Model. Meeting at the perfect crossroads of affordability, portability, and ease of use, this lift continues to exceed users’ expectations. Users say that it comes almost completely assembled, requiring little work to get it running. Although it is pretty heavy – 954 pounds shipping weight – most users report being able to move it on the ground relatively easily. Buyers comment that the lift goes up and down fast, and offers access to get to most parts of the car without trouble. One buyer comments that they were able to lift a 5,000 lb. Ford Flex with no issues. Others say that it is quiet and solidly built. Most of the issues that user reported had to do with shipping. They say that the lift comes on a pallet, is heavy, and does not fit in the back of a truck bed. BendPak is a respected manufacturer and creates quality lifts. 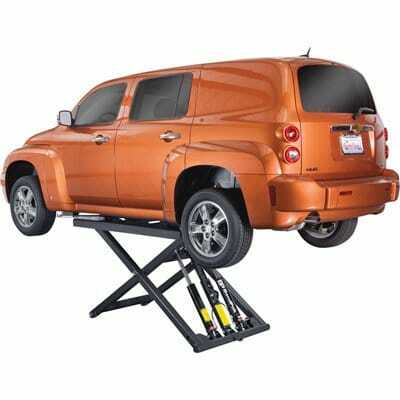 This portable car lift is a well-crafted tool that earns its keep in the home automotive garage. With a scissor lift design capable of lifting up to 6,000 lbs., a compact layout, and solid construction, this is the only lift you need to get the job done. The lift is equipped with an adjustable arm and safety lock bar, bringing both practicality and safety together in one product. Included is also a free truck adapter package. Even though the lift has a small, space-saving design, there may come a time when you need to move it. Moving the unit around the shop is a breeze, because the motor that hoists the car into the air doubles as a dolly. This alone is one of the greatest advantages of this product. When choosing piece of equipment to raise up the vehicle you are working on, on thing should be more important than anything else: safety. No matter how inexpensive a lift is, you should never compromise for an unreliable machine. 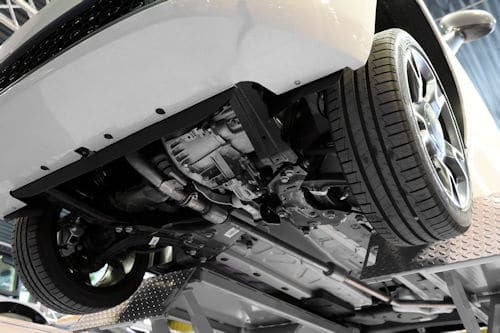 If the vehicle lift malfunctions while you or an employee is under it, it will end up costing you way more than what you would have spent on a more reliable lift. Fortunately, the BendPal scissor lift has tons of safety features packed into it, as to keep you and your employees safe, saving you money in the long run. Besides using quality materials in the construction of the lift, there are numerous safety elements included. For example, the safety lock bar has multiple locking positions, that not only guarantee safety, but versatility. Another nice touch is the commercial grade hydraulic hose. The general opinion of users of this product is that it is effective, and convenient. They say it is compact and saves space, but at the same time, is able to get the job done. Pros – Strong steel construction, portable, fast raising and lowering. Cons – Only holds up to 6,000 lbs., heavy shipping weight. Our recommendation is that you choose this lift if you are in need of an inexpensive, portable, space-saving lift. BendPak offers other scissor lifts that have a higher weight capacity, but for the price, this one offers the most value. If you are in need of something with a higher lifting capacity, or do not need a space saving unit, check out some of the other lifts that we recommend. Although the scissor lift design is great for certain applications, its design has limitations. For example, access to certain parts of the exhaust can be hard to reach. As well, you are not able to fully walk underneath the car once it is lifted up. If you need more access underneath the car, then the 4-post lift is going to be the right choice for you. 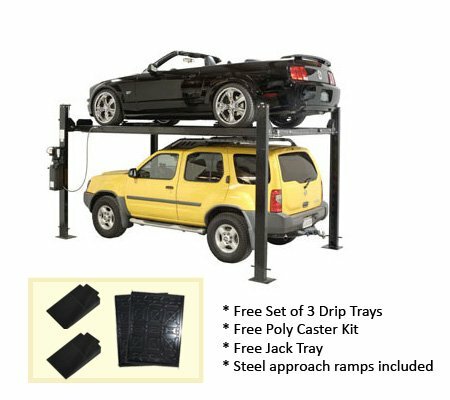 The best choice for a home garage lift in this category is the Triumph NSS-8. The Triumph 8000-pound lift is the ultimate dual-purpose lift. Not only can you lift any car up to 4 tons up and work on it, you can also use it to store a car up off the ground, so you can park another one under it. One buyer did exactly that. He was able to store two of his corvettes, one on top of the other, in his garage. Other users rave about the functionality of this lift. They claim it operates quietly and easily. Most buyers of this product wish that they had made the purchase years ago, as it has saved them lots of time working on their cars. The downsides of this lift are all related to the installation process. The lift does not come fully assembled. although, the more complicated parts are pre-assembled. 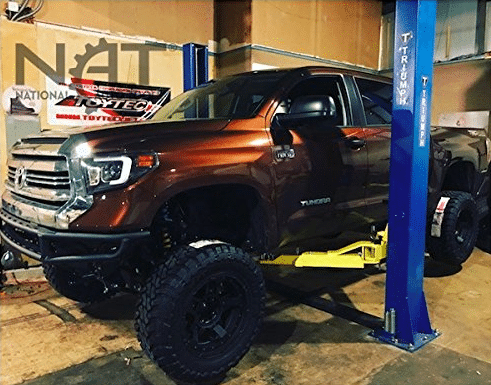 Buyers reported that they were usually able to put the auto lift together within one day, and recommended having up to 4 people to help assemble. Another issue is that clear installation directions are not included. Users had to contact the manufacturer to get these directions. Most buyers agree that once fully assembled, the lift more than satisfies their needs. They say it is a time and space saver, although it can be difficult and time consuming to assemble. Pros – 8,000 lb. capacity, easy to use, quiet. Cons – Difficult assembly, instructions are poor. Note: We found that National Auto Tools carries the NSS-8 lift on their website, and are selling it for $100 less than the Amazon price till the end of this month. They offer free shipping and financing options, so if you are looking to save a little extra money you might want to check it out here. The Auto Lift Car-Park-8 is an excellent choice for the home mechanic if they have multiple cars that they need to store in their garage. Built to double as a tool for both storing and working on cars, the quality of design in this unit really shows. The Car-Park-8 is rated for holding up to 8,000 lbs of weight, which means you will be able to lift up almost any car that you desire. It has decent lifting speed, at 90 seconds to raise all the way up or down. This auto lift is packed with tons of features. For example, it includes a jack tray, that allows you to jack the car up once on the platform. Another nice touch is the set of three drip trays that are included. These trays catch any fluids dripping off of the car, saving you cleanup and hastle. Not only is the Car-Park-8 convenient, it is also designed with safety in mind. The manufacturer went above and beyond when creating this lift in regards to safety. One of the safety features is the Redundant Ladder Locking system that locks in case of a cable failure. Although, the cable is not likely to break, as it is aircraft quality and rated for up to 14,500 lbs. As well, there are extra large slider blocks that increases the stability of the overall system. 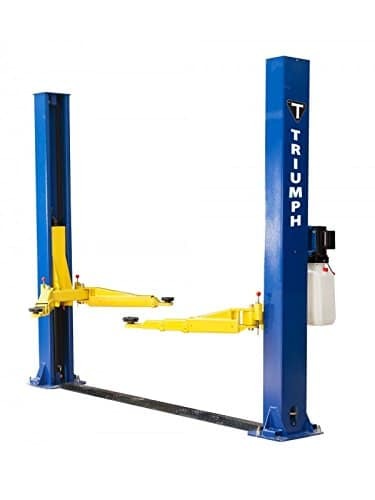 Overall, this car lift is very similar to the Triumph NSS-8. The basic features and included items are all very similar. The Auto Lift Car-Park-8 is a little bit more expensive, although it is larger in overall size. The general opinion of users of this product is that it solid and works well. Assembly was reported to take six hours for one person, although two or more people are needed at certain points. Pros – Tons of safety features, relatively quick assembly. Cons – Bad assembly instructions, poor quality castors. Carriages completely enclosed for safety. Redundant ladder lock safety system with "auto engage" locking bar in the event of cable failure. 10 lock positions. 18" wide runways formed with one-piece 3/16" non-skid diamond plate. Extra-large slider blocks for added stability. The Triumph NT-9 is the way to go if you are looking for a two-post auto lift. With a 9000Lb lifting capacity for less than $2000, this lift allows you to get a lot done for not that much money. It is better rated, and less expensive than any two post lift that we found. Customers rave about this lift, saying that they would definitely buy it again. The major advantage of this lift over the other high capacity lifts, is the easy assembly. One tester of the product said that even though there were no assembly instructions included, the assembly was simple enough to figure out. Being the only two-post lift in this review, we should include some of the benefits of this type. Having a two-post lift saves space in comparison to the four-post lifts. Also, they tend to be less expensive, and have easier assembly. The general opinion of users of this product is that it is a good quality lift at a great price. The installation is simple, and the customer service of the company is great. Cons – requires at least four-inch slab concrete to use. Note: We recently found that National Auto Tools carries the NT-9 lift on their website, and are selling it for $46 less than the Amazon price through August. They offer free shipping and financing options, so if you are looking to save a little extra money you might want to check it out here. This Asymmetric two-post lift is both strong and versatile. With a max lift capacity of 10,000 pounds, it is stronger than all other lifts in this review. Although, this lift is also the most expensive. That being said, there are many features that make this lift worthwhile. The lift has a 30-degree rotated column that allows the car doors to be opened while on the lift. It also has the ability to lift vehicles symmetrically or asymmetrically. Another nice feature that this lift has is the padded safety shutoff bar, that will protect your vehicle from damage. The general opinion of users of this product is that it is even though this lift is expensive, it is very strong, reliable, and safe. They also say it is a great lift for a home garage. Pros – Reliable, Safety features, Strong. Cons – Heavy, may not work with low profile cars. If you are looking for a more affordable way to lift up cars, check out our review of the best floor jacks.